The Jacksonville Jaguars defeated the Minnesota Vikings on Saturday afternoon, 14-10 continuing the second full week of preseason action in the NFL. 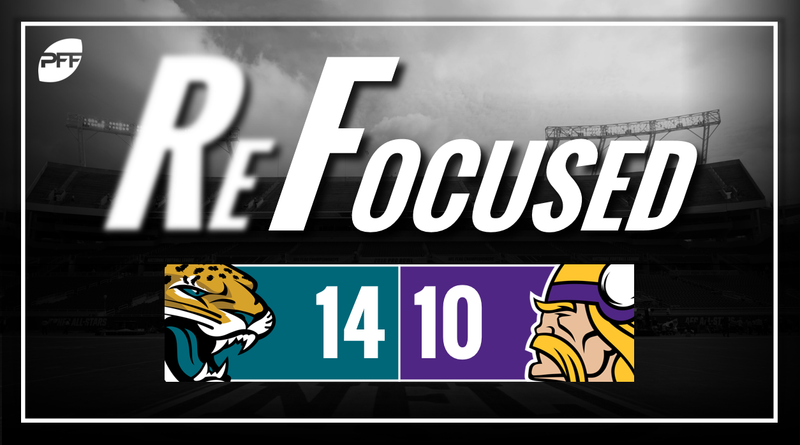 A 17-yard effort from T.J. Yeldon was the biggest gain the Jaguars made on the ground against the Vikings, with the offensive line struggling to generate any real movement on a talented Vikings defense. Linemen were routinely stood up at the line of scrimmage, and stretch runs in particular failed to create any yardage with the runner being forced laterally to the sideline. It was a start to forget for Blake Bortles, as his first two drives resulted in 2-of-4 passes for 14 yards and an interception on his second drive, and very nearly was picked off on the prior one. Backup Cody Kessler kept the ball from turning over, dinking and dunking his way to an eventual narrow victory. He was often scrambling for his life out from the pocket and was rarely allowed the time to settle and make downfield throws. The Jaguars’ defense won’t be happy with its tackling but they still swarmed around the ball and made life miserable for the Vikings. Despite missing Dante Fowler, Calais Campbell, Malik Jackson and Yannick Ngakoue were virtually unblockable, forcing two fumbles and pressuring Kirk Cousins seemingly at will. Jacksonville proved once again they have arguably the NFL’s best young defense depsite a subpar tackling performance. Telvin Smith notched multiple tackles and a sack, utilizing his speed and range to disrupt the Vikings offense while Tyler Patmon looked like a starter as he nearly picked off Cousins on the second play of the game. RB Mike Boone made a strong case for a roster spot with his performance. He had several strong runs, including a 26-yard burst that left the usually secure Jaguars’ defenders on the floor. However, the Vikings passing game didn’t trouble the Jaguars all day. Cousins was shut down by A.J. Bouye, Patmon (starting in Jalen Ramsey‘s absence) and Co.
DT Jaleel Johnson led the team with six tackles as he was a constant menace against the run, clogging up the middle of the field and never allowing himself to get reached on zone runs. Impressing in a small sample size during his rookie year last season, he could be in line for an increased role in 2018. While only on the field with the starters for a couple of drives, Danielle Hunter made his presence felt in a short space of time against LT Cam Robinson. The stat sheet will show just the one sack but Hunter regularly beat Robinson around the edge in quick fashion, saved only by Bortles’ quick releases. Jacksonville: The Jaguars’ win was born out of attrition rather than resulting from big highlight-reel moments, with no offensive play topping 29 yards, and both touchdowns coming from one-yard runs. Rashad Greene added a big moment when he brought a punt all the way back across the field and jetted inside the five-yard line, leading to the go-ahead touchdown. Minnesota: The Vikings defensive line seems poised to make another stand this season with standout performances from Johnson and Hunter.